Today I got to thinking about a concept: More Jesus, less selfie. It goes against everything that’s modeled to us in this world. I, personally, have bought the lie that I need more of everything else — more time, more money, more energy, more creativity, more motivation, more exposure, more of a “following.” Yet the only thing I really need more of is Jesus. And I definitely need less of me. For a long time, it’s been half and half in my life: Half Jesus, half me. But Jesus wants me to be all Him. He isn’t interested in a dual reign or a joint partnership. You cannot serve God and self, either. Jesus also said “If anyone wishes to come after Me, he must deny himself, and take up his cross and follow Me” (Matthew 16:24). But how do you and I deny ourselves today in a society that is constantly urging us to put ourselves first? 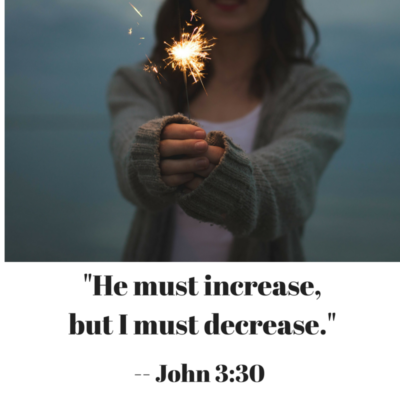 How can you and I, like John the Baptist, live by the motto “He must increase, but I must decrease” (John 3:30)? Less concern for how others see you and more concern for how others see Jesus. Less focus on what you deserve from others and more focus on what you owe Christ. Less preoccupation with your perceived rights and more focus on what it means to be a servant of God. Find Your Identity – and Worth — in Him. It’s easy to find our self worth in our education, accomplishments, titles and positions. We can even find our self worth in our possessions – the higher the salary, the nicer the car, and the bigger the home, the more successful you must be. But the Apostle Paul said “I count everything as loss because of the surpassing worth of knowing Christ Jesus my Lord…” (Philippians 3:8, ESV). Our identity and worth must be rooted in the fact that we are sinners saved by the grace of Jesus Christ alone, adopted into His family, and called His children. You and I are redeemed slaves, orphans who have been adopted and called heirs, beggars who have been given a seat at His table. That reminder alone keeps us from exalting ourselves over God and others, and makes us aware that everything we have has been given to us. Can you focus on these two lifestyle changes this week? I assure you that, as you do, your heart will begin to want more of Him than you. That’s where I want to be. How about you? Cindi McMenamin is an award-winning author and national speaker who helps women find strength for the soul. She has nearly 35 years experience ministering to women and inspiring them to let God meet their emotional needs, grow stronger through their alone times, and pursue their dreams with boldness. on More Jesus, Less Selfie. We do tend to get lost on what the world has to offer and we sometimes forget to remember what Jesus already did for us. I got married recently and I began to focus on what my husband wanted, what I wanted, what WE needed, but we slowly forgot to focus on HIM. We ended up having a lot of conflicts! This week I decided to begin to pray every day, again. (Something I stopped doing, only did it once in a while.) And after reading this blog, my prayers and my thoughts made sense. God is telling me that I need Him and . . . that’s it. He will do his WILL in me and my marriage. Thank you, Liliana, for sharing your experience and how that blog resonated with your heart. While Christ makes us new in Him we often struggle with that old us, the flesh, that wants to live for self. I, too, have found that when Christ is first, my marriage is much smoother.